With this being my first book by Jennifer Smith, I fully expected it to be great. Everyone speaks very highly of her other novels, so I was hoping I wouldn't be let down. And believe you me, I wasn't. This whole book to me was very ironic. One of the main characters, Graham, is a famous movie star who falls in love with a girl from a very small town named Ellie, the other main character. That in itself sounds like a movie doesn't it?! And that had to be my favorite part of the book. Although it was about the filming of a movie, Smith's writing style let it play out like a movie in my head. One thing I loved about this was the main plot pint, or the romance. There are so many cute times that I found myself smiling ear to ear and it didn't even happen to me. But then were times where I was so excited and I felt really bummed when things didn't go their way. (*ahem* the kitchen scene*) But, because of those scenes, it made the ones where they were actually together so much more special. When I started this book, I wasn't in the best mood. I remember I was fighting with family, my boyfriend, and I was stressed out at work, and I just had so much going on. But as I got deeper and deeper into the story and saw all that Graham and Ellie went through, I saw that they belonged together. In the end, their relationship and the book reminded me all that makes me happy and because of that I found myself smiling from the beginning to the very end. This is What Happy Looks Like was cute, but I was kind of hoping for a little more. First of all, for a romance that started through email, there was a significant lack of them (emails). There was some at the beginning and then one before the start of each chapter, but I'd hoped there'd be much more. I wanted to see more of the cute back-and-forth between them and I feel it would've helped to have that background and how their relationship first started. I wasn't really a fan of Ellie. Her immediate dislike for Graham just because of his celebrity was incredibly annoying. I can see the side of the issue where it'd be a problem for her mom and she doesn't like the spotlight, but she was pretty inflexible when it came to working around those issues. Here's this guy you've really been enjoying "talking" to and you just want to dismiss him because of his fame? Not really okay. And then there's the whole money issue. Of course, he's rich and she really isn't. She needs money for something she really wants to do, but can't earn it all on her own. I completely understand her reasoning for not asking her mom. I wouldn't ask for money where there isn't any either. And I completely understand not wanting to ask Graham, but he offers multiple times. And she points out enough times how that money is nothing to him while it's everything to her. I suppose I'll just never understand that kind of pride. I don't have any issues with Graham, but he did feel a little generic to me. And what is up with that ending? It felt too abrupt and I was hoping for a better indication as to their future relationship status. The Nutshell: This is What Happy Looks Like was a quick, fairly cute read, but not without its flaws. I didn't really feel the chemistry between Graham and Ellie, though it probably doesn't help that I didn't like Ellie much to begin with. I was hoping for something more, but in the end I just got a run of the mill, mostly-fluff romance. If Fate Sent You An E-mail Would You Answer? This Is What Happy Looks Likeis about an accidental encounter between a teenage girl from the middle-of-nowhere, and a boy from the middle-of-everything. Ellie receives an e-mail from the famous actor (let's call him the Robert Pattinson of the book) by accident and they strike up a conversation in which they both feel connected. Graham Larkin has never been able to have a normal relationship ever since his life has changed into this (horrible) wonderful Hollywood life. And now that fate has steeped in he has a chance. I really love the cover, the synopsis, and Jennifer E. Smith. If you haven't checked out her other book, "The Statistical Probability of Love At First Sight" then I strongly suggest you come out from under the rock you've been living under. I received this book today, and I finished it today. I know, my life is interesting (sad) and I'm kind of obsessed with reading (a complete nerd). I absolutely fell in love with this book. I hope Jennifer E. Smith continues to write more books with titles like this one, interesting story line like this one, and awesome (strange) characters like this one. I really, really liked This Is What Happy Looks Like. I’ve never read anything by Jennifer E. Smith before, but now I’m curious to see what else there is. It was the kind of book that made me smile just reading it—and I wish I hadn’t read it so fast. The characters were likeable, and I understood where Ellie was coming from with her fears. And Graham, well, he was dealing with troubles of his own. I liked seeing how their relationship panned out. It wasn’t perfect from the start, and was full of troubles and misunderstandings. This is one of the best contemporary novel’s I’ve read this year. The characters each had a backstory. The way the setting was described made me want to visit the town. The romance was sweet and the characters had more of an emotional investment in the relationship, rather than purely physical. And it was clean enough for younger readers to take a look at as well. It was refreshing to read something like This is What Happy Looks Like. I really enjoyed The Statistical Probability of Love at First Sight by Jennifer E. Smith. 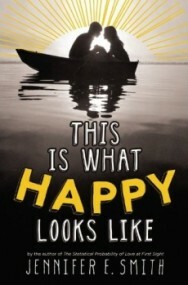 I was excited to read This Is What Happy Looks Like and see what characters and story Smith was going to bring us. This is What Happy Looks Like is an adorable contemporary about two teens who meet by chance via wayward email. Of course, small town Ellie doesn't realize that this mysterious stranger she is crushing on by email is the famous movie-star that just happens to be filming a movie in her town. I really enjoyed the idea behind This Is What Happy Looks Like. The chance email meeting, the movie star/normal girl love interest, the problems and hilarity that is sure to come with that. I think Jennifer E. Smith did a really great job of portraying the characters and how this teen movie star would feel. His quick rise to fame, and it's effect on him, and how no one ever sees the "real" him. While I had to suspend belief on some things, it was a charming story. I really liked Ellie's character. She is spunky and witty. The email correspondences between her and and Graham were full of fun and hilarious things. Graham is a win for me just for having a pig named Wilbur and a burning desire to find a Whoopie Pie. How is that not a winning guy??? While This Is What Happy Looks Like was a delightful read, I do think it is one that will fall off my radar rather quickly. At over 400 pages it was a little long for a quick beach or summer read, although it did seem to read quickly. There was nothing about it, or the characters, that seemed to really pop enough that I think This Is What Happy Looks Like is going to be making a lasting impression on me. Long time, no review, I know. But guys, this is the kind of book I need to gush about. I NEED to talk to you guys about this book. Because it is so, so, so utterly perfect I can't NOT talk about it. This is the kind of book that breaks a review-slump. So, the premise is fairly basic. Misguided emails, one person in this email is secretly a celebrity, they meet and start a relationship. Except...not quite. This story is SO much more than that. Jennifer Smith, in the excellent way she does, gives both characters their own story lines beyond the romance. Ellie has this massive secret and some family issues. Graham has family issues of a different nature, as well as the natural issues that come with being a celebrity. And both have to deal with the complications these secrets and separate issues have on their relationship. Add to the fact that, you know, Ellie didn't KNOW he was famous. Things are complicated and intricate and beautiful and heartbreaking. Jennifer's the kind of writer who pulls you in and never lets go. I read the beginning while sitting next to a friend because she wanted to see my reaction. Then I let myself to take a small break from homework and ended up reading the next 150 pages. I DEVOURED this book and all of it's perfections and Jennifer's wonderful writing. I was enthralled in this story and these characters and their lives. They weren't just characters. They were people. Graham and Ellie and their friends and family were so well crafted and they all had this fantastic chemistry with intricate relationships that only an excellent writer can build. And can we talk about the setting? I've never been to Maine. The closest I've ever been is the suburbs of Boston. And you know, those mansions weren't exactly a small town on the coast of the Atlantic. But the setting was so well built, that I could picture everything. The beach and the town and the street Ellie would walk down and the set of Graham's movie. It was charming and really drew me in to this little Maine town, which can be kind of hard to do when I'm reading from my bed in the middle of a giant city. Seriously, and then there's Graham and Ellie as people. They were far from cookie cutter characters. I mean, Graham. He has a pet pig. Do you know how epic that sounds? And usually you would think a celebrity would shy away from strangers on the internet, even if that internet doesn't know they're talking to a celebrity. But no, he wanted to reach out. Because even in the emails, there was so much personality on both ends and this fantastic chemistry made it easy for them to connect. Ellie and Graham have this wonderful dialogue, via email and in real life. It's realistic - sometimes it's awkward, sometimes it's hard to talk, sometimes everything is easy and light and fun. Guys, Jennifer E. Smith is just a master. She's utterly brilliant. I'm going to declare her one of the Princesses of Contemporary with Stephanie Perkins, Gayle Forman, and Elizabeth Eulberg. I will read anything she puts out in the world for us to read and I definitely have to get my hands on You Are Here and The Comeback Season because, hello, Jennifer writing a ROAD TRIP and BASEBALL? Hell yes. I am ALL OVER THAT SHIZ. So, um. You should go buy This is What Happy Looks Like and rejoice in the wonder that is a Jennifer E. Smith book and then join me in reading ALL OF HER BOOKS EVER.